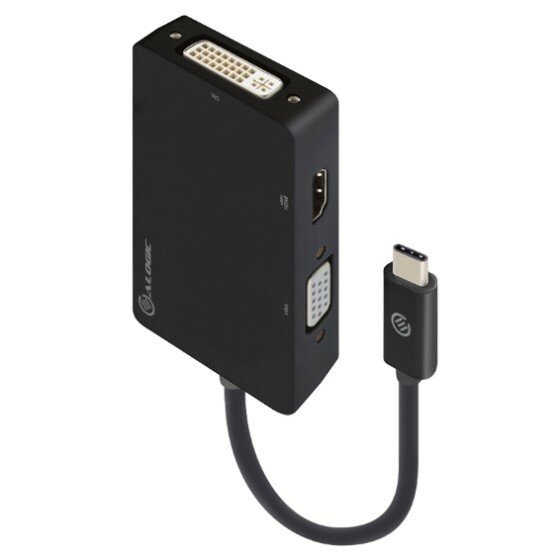 The Alogic USB-C to HDMI DVI VGA Adapter is an innovative 3-in-1 solution for connecting a USB-C enabled source such as a Laptop or MacBook to a HDMI DVI or VGA enabled Display. Multiple outputs from the adapter ensures compatibility with almost any Projector Monitor or Display for travel or BYOD (Bring Your Own Device) applications at the office. The adapter is compatible with most of the USB-C enabled computers with support for USB-C Display Alt. mode and Thunderbolt 3 ports. The Plug-and-Play adapter has a small foot print and lightweight design perfect for travel or BYOD (Bring Your Own Device) applications at the office.The adapter does not support multiple displays at the same time and only one video output is supported on the adapter at a time. If multiple displays are connected at the same time only one of the output will function.3-in-1 Video Outputs:Multiple outputs - HDMI/DVI/VGA from the adapter ensures compatibility with almost any Projector Monitor or Display for travel or BYOD (Bring Your Own Device) applications at the office. The adapter is compatible with most of the USB-C enabled computers with support for USB-C Display Alt. mode and Thunderbolt 3 ports.Compact and Portable:The adapter has a small foot print designed for portability and use as a travel adapter or on a desk for connecting to a monitor/projector. 4K Video Output:The adapter supports up to 4K Ultra HD 3840 x 2160 @ 30Hz resolution through the HDMI port for connecting the latest projectors and displays.